The Workshop School has a very different vibe than most Philadelphia Public Schools. As a graduate student this year, I have had the opportunity to visit many schools in the area–public, charter, and private. The only school that I have visited this year that can be likened to the atmosphere at the Workshop School is a wealthy, private, suburban school, rooted in the Quaker tradition. Why? Certainly, it’s not that the Workshop School and this private school have the same funding, unlimited resources, or pristine facilities. (Donations welcome here!) In my opinion, the similar vibe is due to both schools’ fundamental belief that all children should be trusted and given the opportunity to grow, learn, and explore as inquisitive human beings. The Workshop School doesn’t have a metal detector, and students are allowed to move about the school in ways that aren’t militarized or scripted. Students are allowed to use tools and borrow supplies that will support their learning. Students are given real choices and taught how to manage their time on their own. In an educational era that is driven by data, testing, and behaviorist school rules, the Workshop School believes that all children should be trusted, valued, and taught how to think for themselves. We haven’t figured it all out yet, but beginning with trust seems like a great place to start. 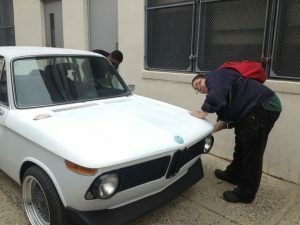 Below: Juniors work outside to prep a car for a new coat of paint. 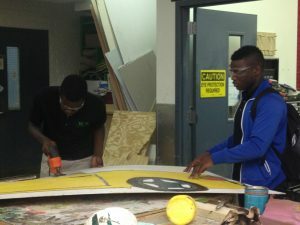 Far below: Freshmen use the workshop to create props for the school play on June 3rd.